UPDATE: iBird Pro version 2.2.1 is now available on both Google Play as well as Amazon.com. It’s approved for the Kindle Fire and for any Android smartphone or tablet. The way the installer works has completely changed. We no longer allow downloading one species at a time or all the birds starting with a certain letter of the alphabet. Instead the entire database is downloaded before the app can be used. I will be updating the blog in the next week to give more details for for now please update your current version of iBird. We have discovered that occasionally the server we use for storing our database (MaxCDN.com) will drop a connection while its syncing. When this happens it can cause the entire db to be corrupted and the only solution is to erase the database, uninstall iBird and start over. We have a solution we hope to implement soon that keeps track of the download of each file and if it drops the connection iBird will retry three times to reestablish the connection. If you would like to beta test this for us, please send an email to support at ibird dot com with the title “Would like to Beta Test iBird” and reference this post. This FAQ is written for the newest version of iBird Pro for Android: version 2.0.9 and 2.0.10. Unless you are already a very patient and hard to ruffle person, I suggest you jump down and read my earlier post iBird 2 for Android Troubleshooting FAQ. This was written in Nov of 2011 and will not only cover issues with pre 2.0.9 iBird Pro but also help you get through the non trivial issues that arise when dealing with Android software. 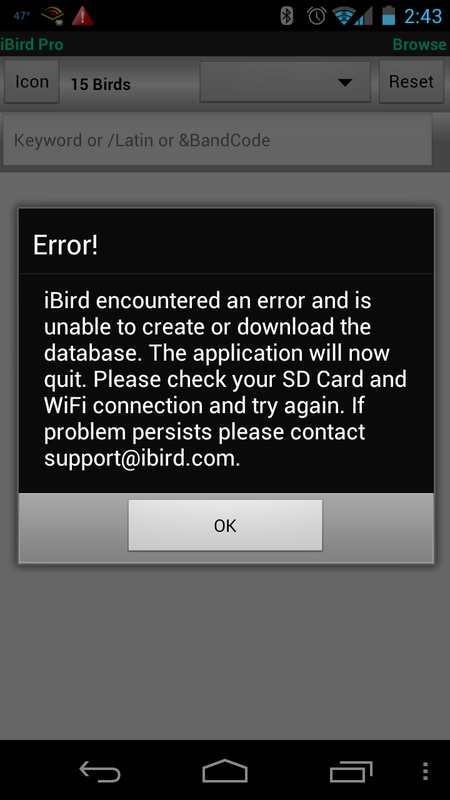 The message “iBird encountered an error and is unable to create or download the database….etc” means something has gone wrong during the installation of iBird. We are working on a solution to prevent this but for now to fix this you need to uninstall iBird from your device (phone or tablet), remove any iBird database folder that may have been created, and try to install the app again and sync its database. The rest of this FAQ explains how to do that and gives tips on how to make sure the sync is successful. iBird’s database is very large, pushing towards 600 MB. We often get complaints about its large size. Less frequently we get complaints that there are not enough illustrations, photos or other content. The deal is you can’t have both large amounts of data and small size. You want higher resolution? Then you have to accept that data is going to consume more space on your phone or tablet. Why not just put it on a server and download as needed some people ask? Because that means you wont be able to view it in the field where there is no WiFi or cellular connection available. Maybe someday when telecommunications is so ubiquitous that everyone has there own personal satellite in orbit a server solution will work. But for now downloading the database is the only good solution. And it’s really not that hard as long as you take a few precautions before you start. Here are some tips to help increase the odds of not running into trouble. Only download the iBird database over a fast WiFi connection. DO NOT USE YOUR CELLULAR CONNECTION. Because most cell carriers are metering the download of data, if you go over your monthly allotment you will incur additional costs. Insure you have at least 1 GB (One gigabyte – 1,000 megabytes) of space available for the iBird database. While it only uses half that, as it downloads it may put part of the files in a temporary part of your memory so at times you can have twice the space consumed. Once the database has finished it will take up the advertised amount. Set the Display Time out setting to Never or as long as you are allowed on your device. If you have problems downloading please don’t leave a 1 star review that says “This product is a ! @#$%^ and won’t download”. Instead take the adult approach and write to our support group using the form we have prepared to help us do a good job. Here is the link: iBird Support Form. If you just want to drop us a quick question you can use the email address support@ibird.com. But we warn you – if you need more help you will have to fill out the form and we will send you to it. Its not uncommon for the database to stop downloading in the middle of the process. We are working on a programmed solution to this but for now we have put together this quick tutorial on how to cure the problem manually. Step 1. Go to the More Page to start the synchronization (downloading) of the database. Step 2. Read the instructions. Step 2. Read about the different ways to sync the database. You can sync in small sections by selecting then syncing all the birds starting with the letter A, then move to B, and so on. Or you can Sync All the birds at once. 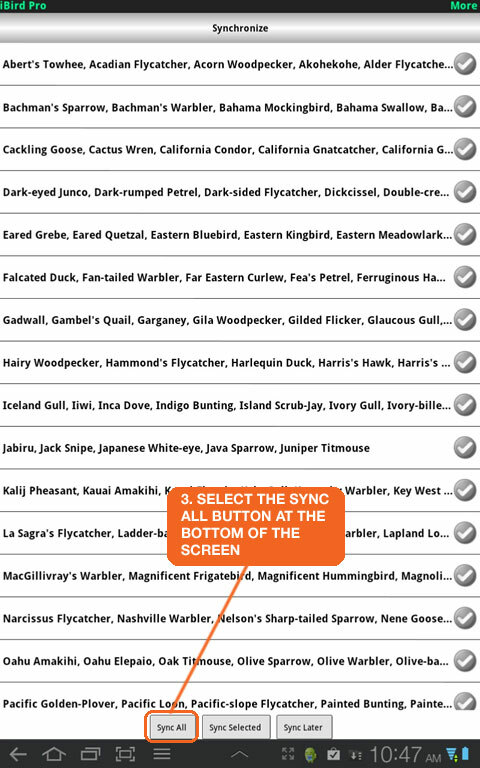 You can even sync one bird at a time by just opening its species page and waiting for the data to download. Step 3. 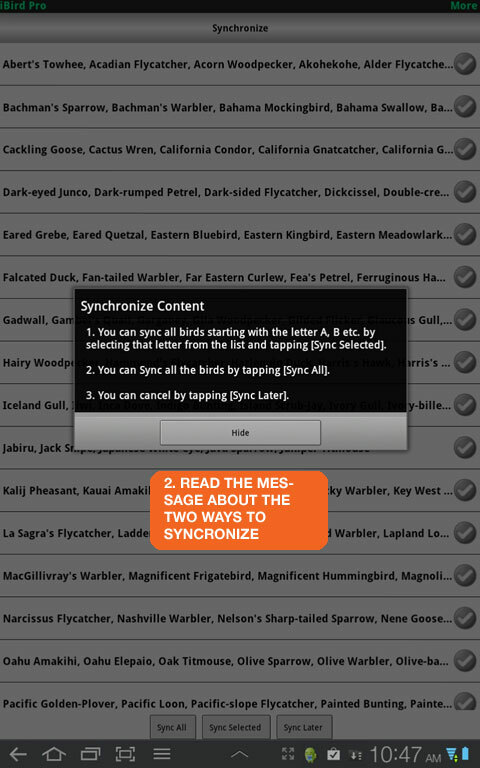 Press Sync All to sync all the birds in the database. You will need to monitor the progress. Step 4. Monitor the downloading. If the progress bar stalls press the hardware back button than press Sync All to resume. Step 4. Monitor the progress bars as the download continues. If the progress bar stops and does not move for more than a few minutes press the hardware Back button then press the Sync All button again. 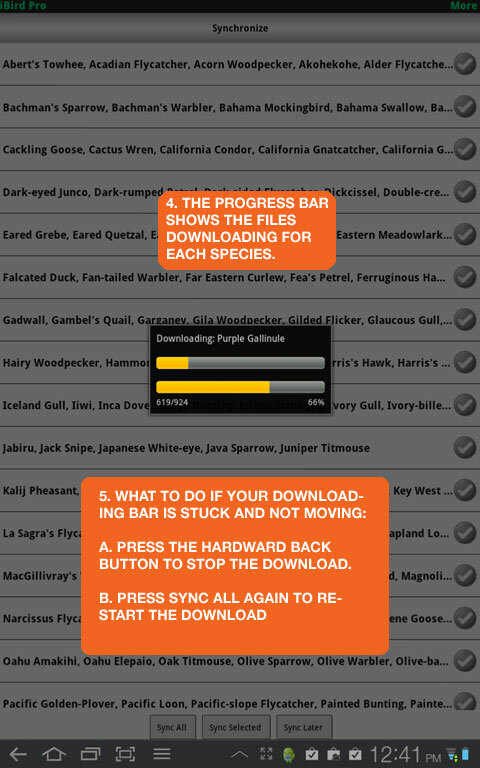 You will see iBird verify the species that have already been downloaded and the bottom progress bar will move. Once it gets to the first bird that was stuck the progress should resume. Some people have found that iBird gets in a state such that it can’t finish the installation or synchronization. Or it gives an error that there is no SD Card and you know that you have an SD Card and its got plenty of room. In this case the best solution is to start over. Here is how to do that. One of the first thing you need to do is make sure you have a good connection to the internet with a fast WiFi. We have seen many situations where the customer thinks they have a fast WiFi only to discover upon testing this is not true. Why is bandwidth important? Because iBird is a really large database. In fact it’s too large to store in the Google Market. To understand this lets calculate how long it takes to download a 600 MB set of files over a 1 Mbps connection, which is typical of a wireless router connected to a DSL network. Assuming a byte is about 8 bits a 600 MB file is 600 x 8 or about 4800 megabits. 4800 megabytes divided by 1 megabits per second = 4800 seconds. In minutes this is 4800/60 = 80 minutes or 80/60 = 1.33 hours. Call it 1-1/2 hours. Because there are several thousand files that make up the iBird database there is a good deal of overheard so that the actual download will be even longer. Consider a 50% efficiency the download time can double to 3 hours. If your bandwidth is 2 Mbps you can assume your download will be 1-1/2 hours and if its 6 Mbps it will take 3 / 6 or 1/2 hour or 30 minutes. I have a cable connected to a very fast router and speedtest.net says my bandwidth for download is 20 Mbps so should I expect it to take 3 / 20 = .15 hours or 9 minutes? I wish. The problem is the tablet or phone can’t process files as fast as my bandwidth seems to allow. The best I have been able to get is around 15 to 30 minutes. Keep in mind that some ISPs will slow down your network if it thinks you are hogging the bandwidth and so the calculations can go out the window. Another factor are the servers that stores the files for iBird. If there is a lot of traffic on them it could slow the download time. We see this sometimes when a new update is first released and thousands of customers are attempting to update at the same time. To test it you can download another app from the Market. My favorite is speedtest.net. Run this app a few times and make sure your bandwidth is as fast as we described in the previous section. If its lower take a look at your router to see if its using the right protocol or talk to your Internet ISP and see if they can explain why its not faster. Remove the iBird Pro folder. Use a third party file manager app from the Market. My favorite is Astro File Manager. Find this app in the Market, download it then use it to locate the folder iBird_Pro on the SD Card. If you don’t have a physical SD Card you can find it in the folder mnt/SDCard. Now since you have already purchased iBird you can go to the Market again, search for it by typing “iBird” in the search box. Now go ahead and reinstall iBird. When it is done resync the database. Hopefully this time your installation and syncing will work better. If you continue to have problems please contact our support team and we will work with you. One wise user recommended disabling “automatic updates” for iBird in the Google Market. Reason? If this setting is ON (the checkbox is checked) Google Market will try to install a new update to the app in the background. That could lead to problems, for example if you are on a slow network, don’t want to incur the costs on a cellular network, or if you happened to be in the field. If you keep automatic update OFF the Market will still let you know if there is an update when you go to My Apps in the store. But it will be up to you to start the update so you can do it when you have a fast WiFi connection. 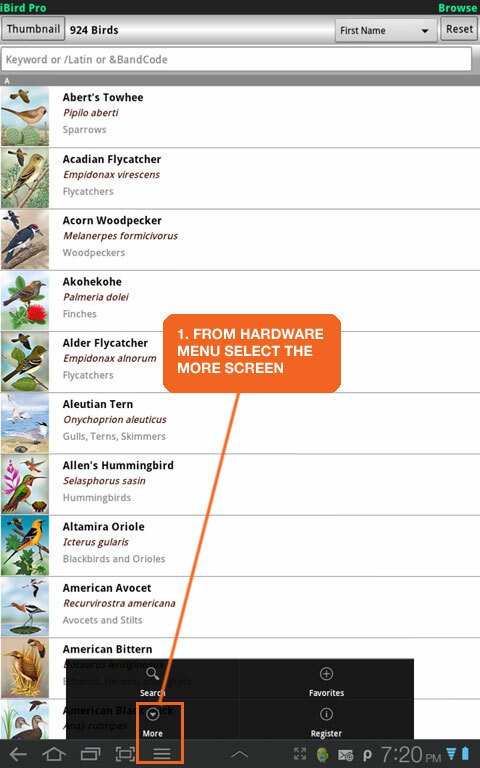 Note iBird will still let you know if there is a database update because we do that in the app. And of course you can press the Later button to do the database update some other time. Time to Buy Apple Stock? Why doesn’t the iBird 3.0 Update work on my device?